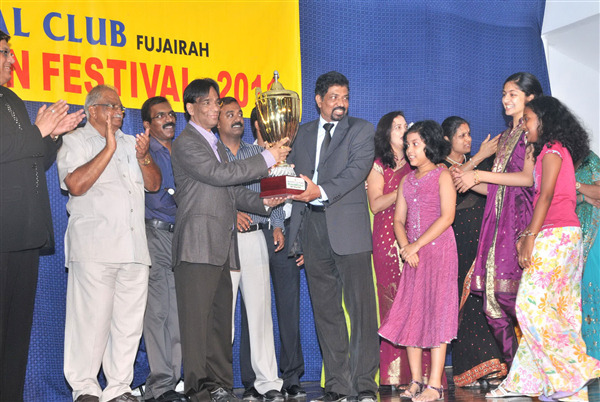 The Indian Social Club in Fujairah congratulates the winners of the Inter School Children’s Festival 2011 After conducting the three weekend spree of Children’s Festival Wining participants in the annual schools competition were treated with a colourful and festive evening during which they received their well-earned trophy and certificate. The event started with the trophy distribution and followed by Winning participant’s performance which made the whole event colorful. With the extensive and cordial support of Ladies Forum members, the executive committee could made the whole event became a memorable and successful one. 2700 school children took part in the completion divided along age categories and in which competitive events also pit schools against each other. This year’s Inter Schools Children’s Festival was the 9th to be organised by the Indian Social Club and it took place over three weekends in May. Guests on the night were invited on stage to hand out the prizes to the winning groups and schools, in a night which reflected a true sense of a community occasion.